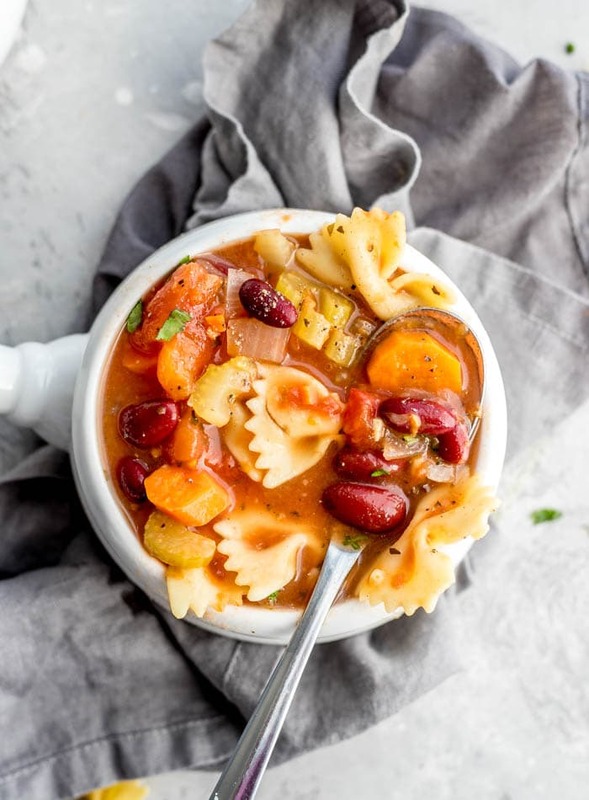 This easy vegan minestrone soup recipe is so great for a quick weeknight meal. It can be on the table in about 25 minutes including prep time and it makes a healthy, filling meal that the whole family will love. Can I Sub the Vegetables? Sure! You can use any veggies you like up to 2-3 cups. I would keep the onion and garlic in there but from there you can sub in other veggies like brussel sprouts, zucchini or bell peppers. I sometimes add 2 cups of fresh spinach or chopped kale at the end just to get some greens in there. You can use any kind of pasta you like! I’ve used whole wheat bows, rotini and fusilli. To make it gluten-free, you can use chickpea pasta, lentil pasta or a quinoa or brown rice pasta. Just check the cooking time for the type of pasta you use so you have a general idea of how long it will take to cook in the soup. 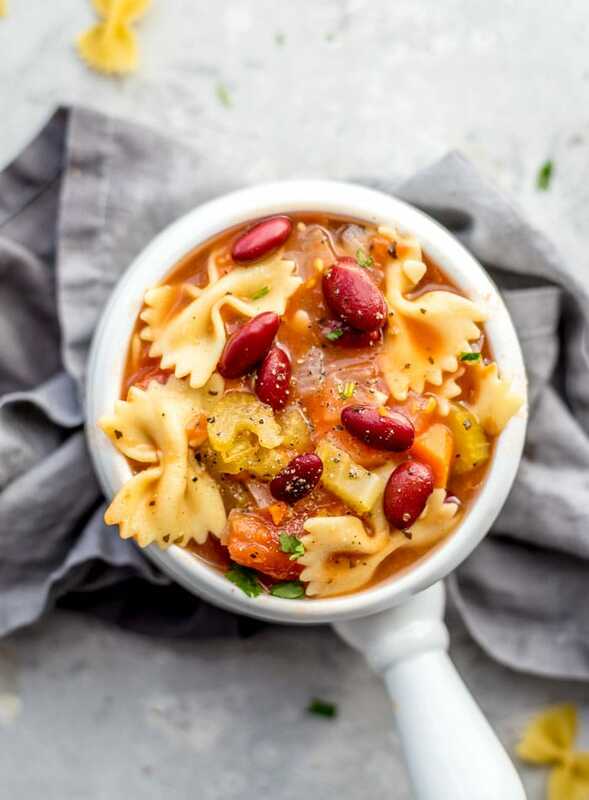 This vegan minestrone is healthy, filling, budget-friendly and easy to make in no time at all. It’s been a go-to at my house lately when I don’t feel like thinking too much about dinner. I hope you enjoy it too! This recipe makes 6 large meal-sized servings or 8 smaller servings. 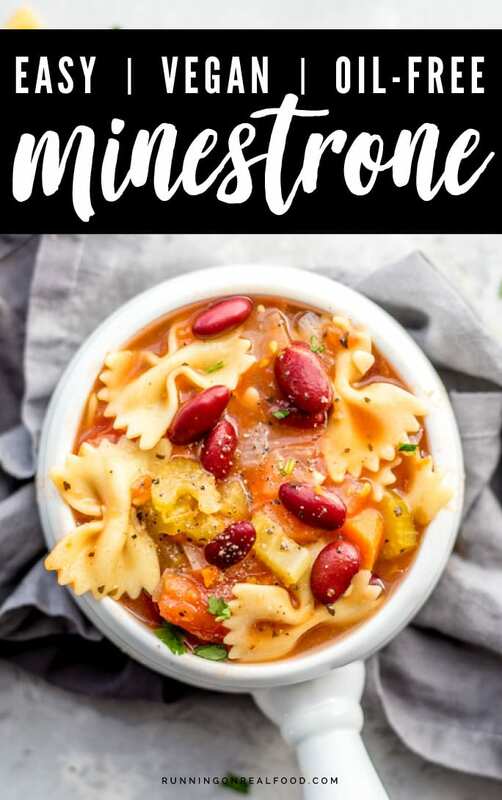 If you make 6 servings each serving provides 131 calories with 27 grams of carbohydrates, 1 gram of fat, 6 grams of protein and 5 grams of fibre. For more nutrition details see the nutrition facts box below. For more information on plant-based nutrition, check out my vegan nutrition guide and list of the best vegan protein sources. Just starting out? Read my post on how to transition to a plant-based diet. 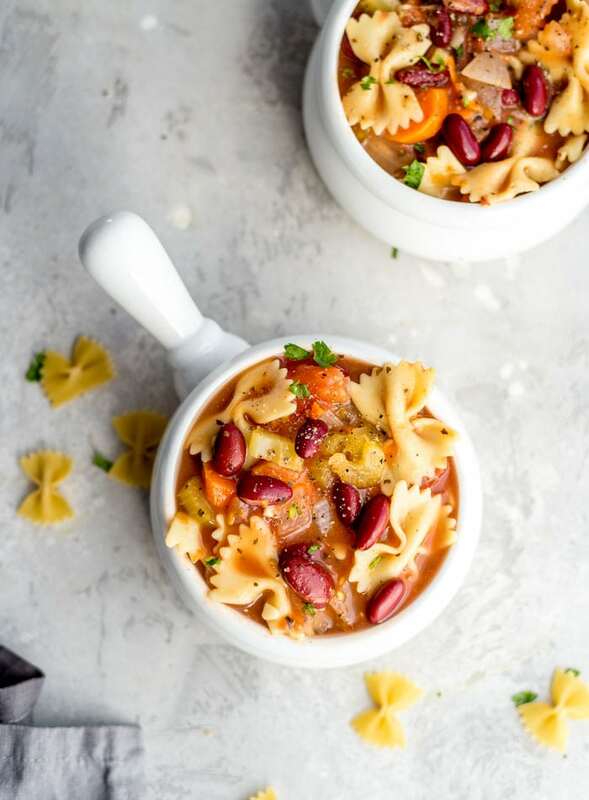 This easy soup is perfect for weeknight meals when you want something quick but still hearty and healthy. It’s great for cleaning out the fridge and pantry too! Switch up the veggies with anything you like such as chopped zucchini or green beans, up to 3 total cups. Add the onions, garlic, carrots and celery to a 7.5 qt. soup pot and cook over medium heat in 2-3 tbsp of water or broth for 10 minutes, stirring frequently and adding water as needed if it starts to dry out. Add the diced tomatoes, herbs, broth, beans and pasta and simmer lightly until the pasta is tender, approximately 10-15 minutes depending on the kind of pasta you use. If you want to add some spinach or kale, stir that in now and turn off the heat. Season with salt and pepper and either serve right away or store in the fridge for up to 5 days. It is really good and so easy! Let me know how you like it if you make it! Omg, this soup looks fantastic! I’m so excited to try it. It’s great! I hope you enjoy it! Let me know if you make it. How much beans? It doesn’t say. Oops. Sorry I missed that! I used one 19 oz can of kidney beans. I’ve added that to the recipe. Thanks. Thanks for sharing this recipe! 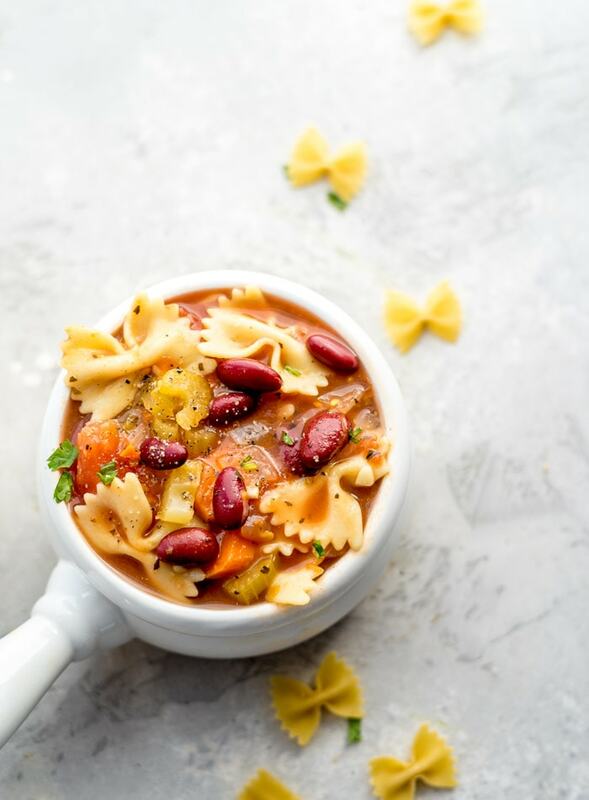 I love vegan minestrone soup and this one has a completely different flavor palate than those I’ve made! It’s perfect for a week of my cold weather lunches!! Ooh so glad you liked it! I enjoyed it for days after making it too, it only gets better! This recipe is a real winner. Really easy to make it. Hearty and filling. Very much appreciated on this fresh, rainy cold day in Ireland! Thank you so much. Thank you for the comment! I’m so happy you enjoyed it. I love how easy it is too..and so good! This was dinner tonight. Seriously SO good! It’s so flavorful and cozy. I used crushed tomatoes instead of diced which probably changed the consistency a little but I really liked it. Thanks for the recipe! So glad you liked it, Bethany! Ya, it might have been a bit less thick and chunky with the crushed tomatoes, but other than that about the same. Just made this for dinner and it is so simple and very good !! Liked it a lot. Thanks for sharing. I’ve made this recipe a few times and my family loves it. I like to add a can of rotel also because I like it spicy and I add zucchini instead of spinach. I also use gluten free pasta. I usually double the recipe because we enjoy it for days after! That’s awesome! I had to look up what Rotel was..I’d never heard of it! Glad you enjoy the recipe. Thanks for the comment! At which point in the cooking process do you add the dried basil & oregano specified in the ingredients list? They can go in with the tomato and beans. Enjoy! Nice, thanks for the quick reply – making this right now!